We are proud to announce our new Video on Demand Pages. 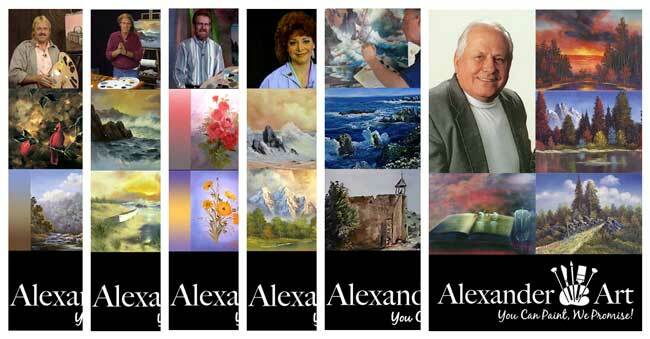 Master Artist Bill Alexander and his friends are now available for viewing or download with a single click. We have over 100 episodes of master artists like Buck Paulson, Diane Andre, Lowell Speers, Robert Warren, Tom Anderson and, of course, the great Bill Alexander. I do like the videos on demand very much. I like Tom Anderson’s teaching and was going to rent Tom Anderson – Season 1 on VOD. Unfortunaely the video is no longer there. Is there another way to see this series? Working on it, Reba. We weren’t satisfied with the quality of the video and we’re trying to improve them. We hope to be able to repost them soon. I guess since it looks like Tom Anderson’s videos do not have a link above and this is almost 3 years old, you’re not going to be redoing the videos. Actually, I started working on one the other day. We have about twenty of his videos from when he was on public access T.V. in California. Not trying to make excuses, but we have a lot going on now. Editing and posting his videos are on our list, though. Thanks for asking (and prodding us a bit). I would love to see MORE of Lowell Speers please! Love him!!! I can not find and open my Bronzerpaid side…Why not? I have checked to make sure you have access to the Bronze Membership access. Everything appears to be working. Try signing out and then back in. look over on the left, you will see Member Library, click on that. Hope this helps, Happy Painting!